Solange wrote and recorded “Proud Family” with Destiny’s Child for the Disney Channel show in 2001. 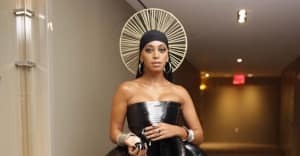 During her set at Roots Picnic on Saturday, Solange revisited the track that marked her entry into the music industry: the theme song from the Disney Channel show, The Proud Family. In a video captured by a fan, Solange begins singing the song and is quickly joined by seemingly the entire audience. Solange was 15 when she wrote and recorded "Proud Family" with Destiny's Child. The song served as the show's theme for the duration of its three seasons. Watch Solange lead the Roots Picnic crowd in a sing-along of The Proud Family theme above. Thumbnail image: Roots Picnic / Instagram.